What do the JSE listing requirements say about the King Code? Is the King Code part of the requirements? Do listed companies have to comply with the King Code principles? Have the JSE listing requirements changed since King III or are they still the same? Listed companies must apply all the King Code principles and only the King Code practices the JSE has made mandatory. 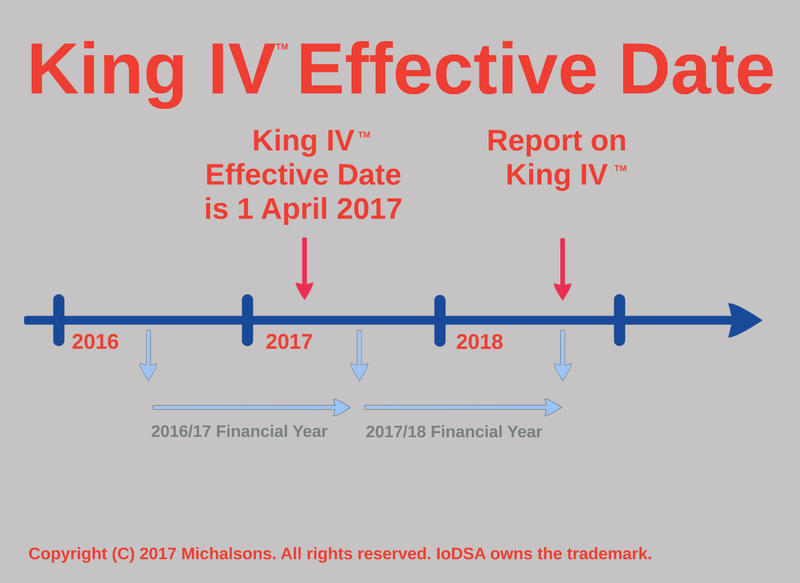 The JSE amended the JSE listing requirements in May 2017 after the Institute of Directors in Southern Africa (IoDSA) released the final version of King IV™. Under the amendments, listed companies do not have the choice that non-listed companies have – the choice to apply only some of the King Code principles and explain the ones they have not applied. Listed companies must apply all the latest King Code principles, including IT Governance (sometimes called IT Governance, Risk and Compliance). You can have one committee that serves all these purposes or one for each. For example, many companies have one audit and remuneration committee. You must check the amendments to get the full list of practices you must apply. This includes not only applying the King Code principles but also explaining which practices the listed company applied in respect of those principles. Listed companies must also explain how they comply with King Code principles and recommended practices. The JSE can suspend a listed company’s listing if they do not apply all the King Code’s principles and explain how they applied it. Where can I get the amendments? The May 2017 amendments are available here. The previous version of the JSE Listing Requirements is available here. The JSE has not yet published the latest version that incorporates the May 2017 amendments. When do the amendments take effect? Already-listed companies (companies that listed before 19 June 2017) must, from 1 October 2017 and onwards, apply the practices that the amendments specifically require and disclose their application. Newly-listed companies (companies that listed on or after 19 June 2017) must, from 19 June 2017 and onwards, apply the practices that the amendments specifically require and disclose their application. If listed companies want to apply (voluntarily) other King Code recommended practices, they must apply them during the financial years that started after the King IV effective date (1 April 2017) and disclose their application at the end of those financial years. The impact of the JSE amendments on the King IV effective date is that you will have to apply and disclose your application of certain specified practices even before the time King IV actually says you must do so (the end of your financial year). For example, King IV currently applies only to listed company whose financial years started after the 1 April 2017 date, meaning that if your financial year started before that date King IV does not apply to you. But now the JSE amendments disregards some of that and says that you have to apply whatever practices it specifically requires from you on the date it requires you to do so on. Make the right disclosures for King IV by asking us to assist you. We have created clever ways to assist you to draft accurate and customised disclosures for your organisation as painlessly as possible. 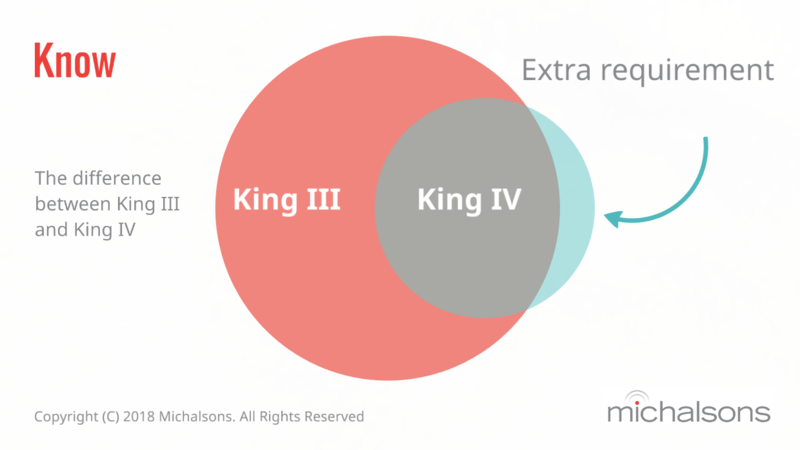 Transition from King III to King IV™ by getting our King III to King IV Comparison Tables and King Planning Tool. 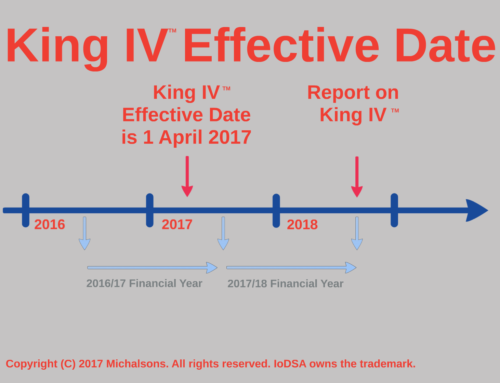 Understand how the timeline of the effective dates for King IV and the latest JSE Listing Requirements affects your compliance by asking us to advise you. Align your IT policies with the King IV™ principles by asking us to review or draft IT policies that are compliant with the principles. There was much confusion with whether or not listed companies had to comply with King III on governance, or whether they had room to not apply it and then explain why they had not. Many thought that a listed company had to comply with the whole of King III, because it was a listing requirement. That is the time when the JSE published the guideline in its listing requirements to help clarify the situation. The JSE’s approach was that certain principles were mandatory and must be complied with, while others were not. None of the IT Governance principles were mandatory, but some principles that have an impact on IT Governance were. Are you interested in reading the King Code? 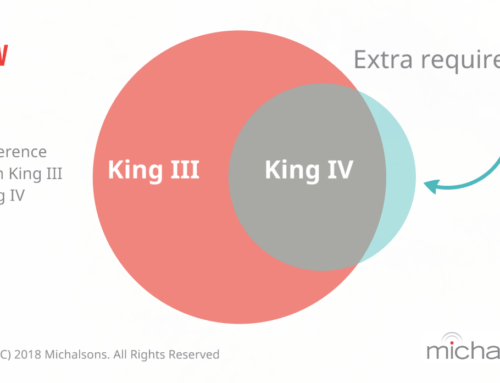 You can also read the latest King Report and King Code on Corporate Governance or our King IV summary.